CAUTION: The engine should not be turned off or the key removed from the ignition key cylinder while the car is in motion. The steering wheel is locked by removing the key. NOTE: Do not hold the key in the "START" position for more than 15 seconds. NOTE: If difficulty is experienced in turning the ignition key to the START position, turn the steering wheel right and left to release the tension and then turn the key. 1. 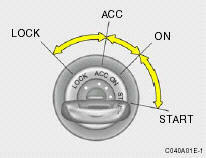 Turn the ignition key to the "ACC" position. 2. 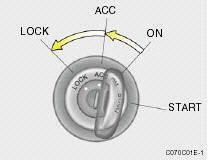 Simultaneously push and turn the ignition key counterclockwise from the "ACC" position to the "LOCK" position. 3. The key can be removed in the "LOCK" position.